Each screen in your prototype is created out of a template. Find a prototype’s template in the Templates palette. Select one to access its contents and start working with it as the foundation of a screen. Follow the steps below to create a new template for your prototype’s screen(s). 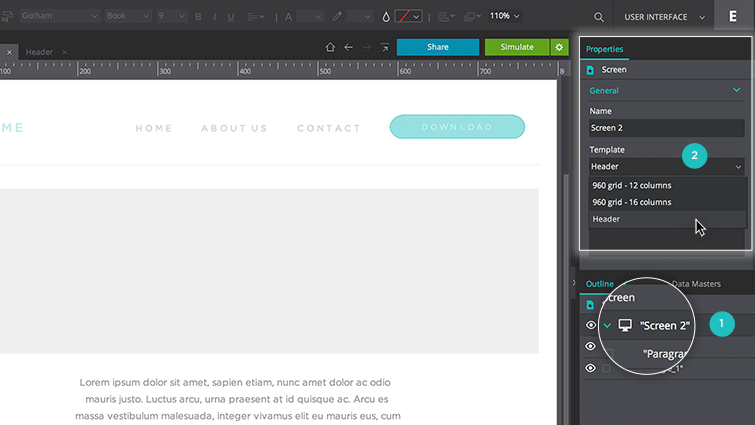 You can also add interactions to UI elements associated with a template from any screen. Learn how to create interactions in Justinmind here. 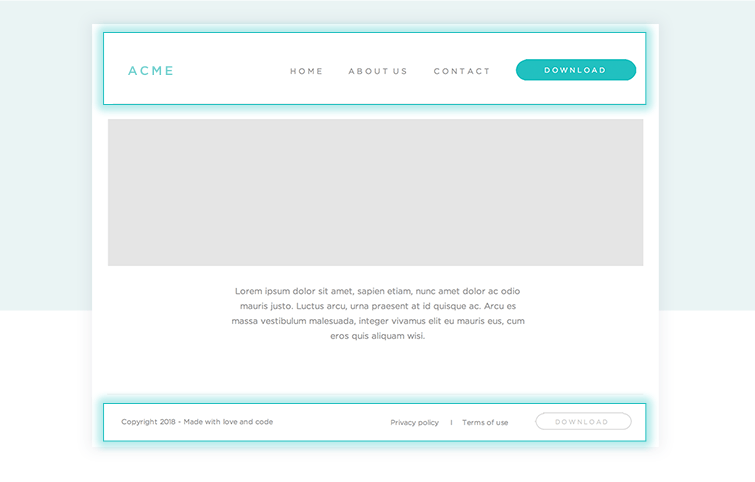 Note: all interactions defined in your template will take effect in all screens assigned to that template. 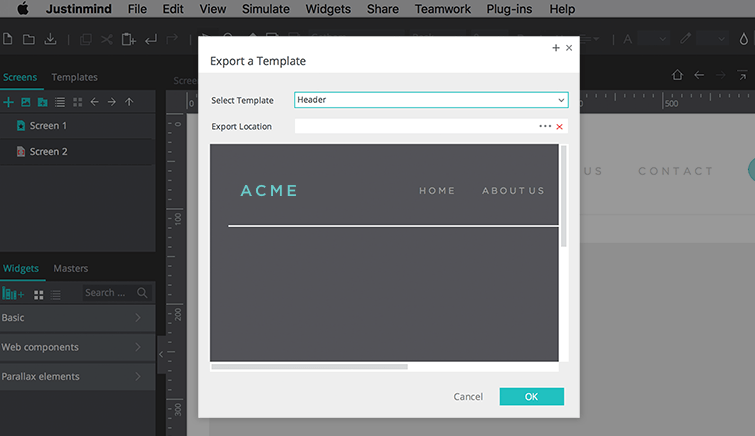 Any additional screens you create will automatically be assigned to this template. Templates allow you to centralize important UI elements, styles and events so that you can reuse them in different screens and maintain consistency throughout your design. 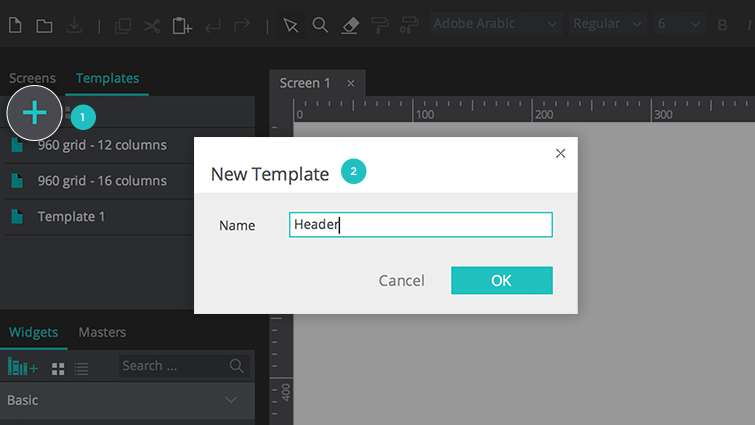 When you assign your template to a screen, the default position of each UI element in the template will remain unchanged. A template’s UI elements will appear to be more transparent than other UI elements on the canvas by default. This is to help you differentiate between elements dragged directly to the screen and elements associated with a template. 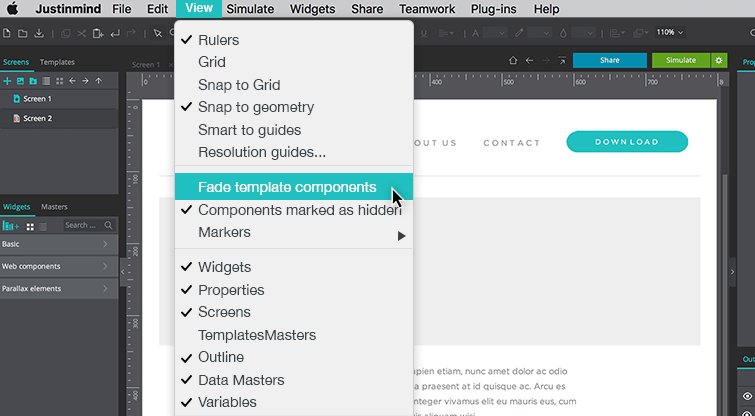 You can deactivate this by de-selecting the “Fade template components” option from the “View” main menu option. 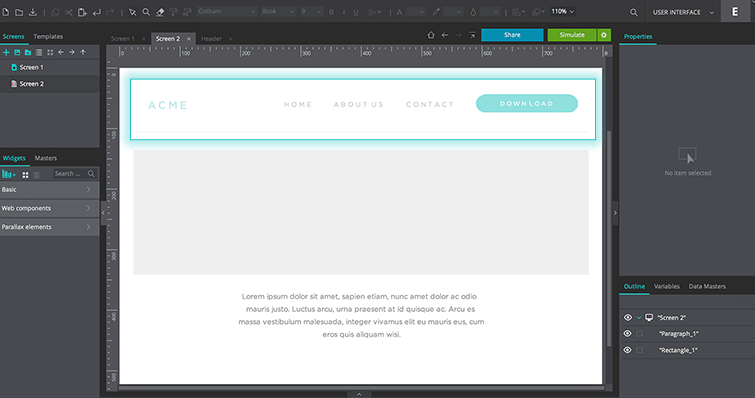 You can define the default styles of the UI elements associated with your templates. To do so, right click on a template and select “Edit Template Style”. A “Set Default Styles” dialog will appear. Here you can change the appearance of your template’s UI elements (e.g. dimensions, transparency and padding). Then, drag and drop customized widgets to the canvas. Notice how their appearance reflects the changes you have made. Note: changing the default styles of UI elements will not affect UI elements already placed in a template. 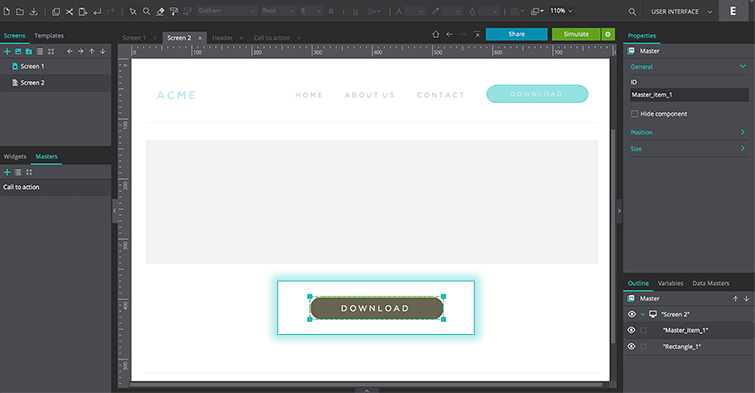 To set the default style for all UI elements within a template, see the section below. To apply the default styles to all UI elements within a template: Ensure that the relevant UI elements are within the template. 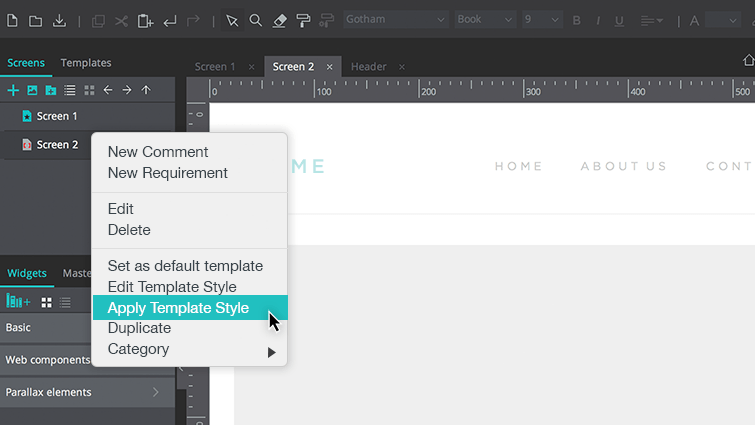 Right-click on the template in the Templates palette and select “Apply Template Style”. A dialog box will appear. Here you can choose which elements you want to set the default style to and then click OK.
You’ll see that all instances of the selected UI element(s) have taken on the default style. 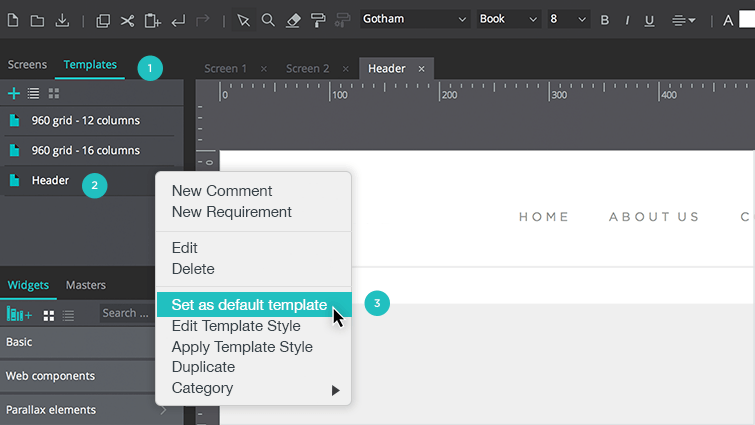 To apply default styles to all elements within a screen, right click on the screen and select “Apply Template Style”. The default styles of a specific UI element can also be defined in the Properties palette. This enables you to make changes to an individual UI element, rather than create rules for all of their instances. To do so, select the UI element in the template, modify if in the Properties palette and then select “Set as default style for this widget” in the corner of the Properties palette. Go to the Screen that contains the UI element you want to apply your default style to and select the UI element. Go to the Properties palette and select the “Apply default style to this widget” in the top right-hand corner of the Properties palette. 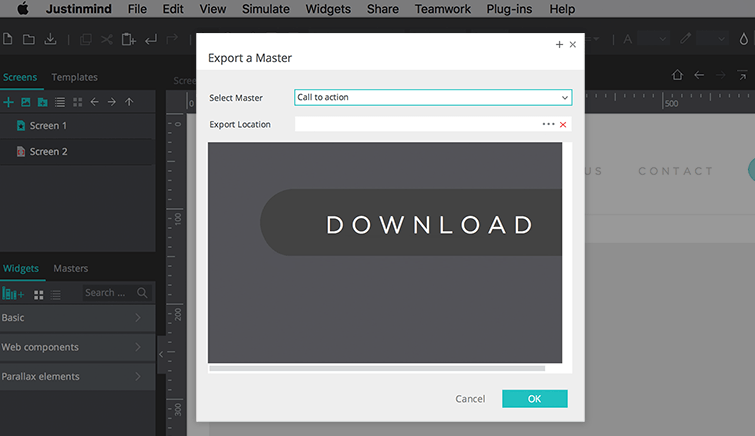 In the dialog that appears, select a template and export location. Click “OK” to export the template. To import a template, choose “Import” from the main menu. In the dialog that appears, browse your folders to find the template. Click “OK” to import it. 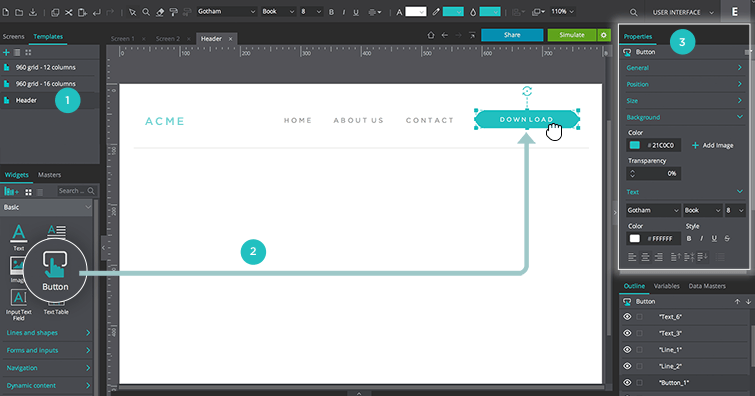 You can also import a template by drag and drop: just drag the file from your file system and drop it on the Templates palette, a screen or a template. Masters are groups of UI elements that can be reused across screens and within templates in a prototype. Use them to spread global changes across all screens and/or templates in your prototype. Content associated with a master will appear yellow in color and slightly transparent. Drag widgets to the gray Canvas. You can make them interactive by adding events. Note: as with templates, you can also add multi-target events to masters. Learn how to add events to UI elements here. Once you’re done editing, drag and drop the master to the screens or templates you want to apply it to. 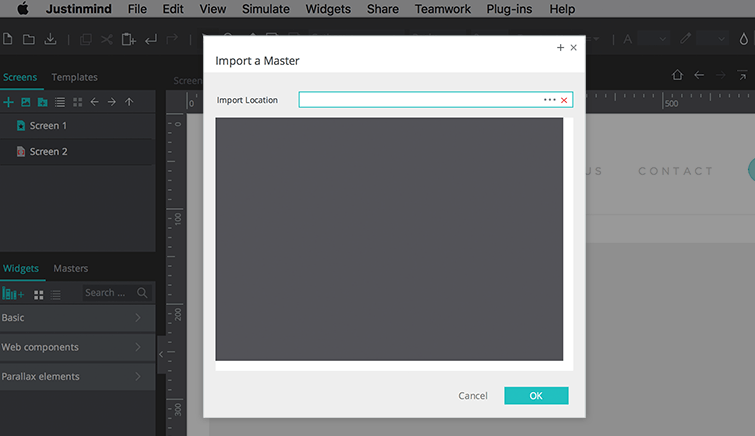 If you want to edit/change your master once you’ve placed it within your screens, click on it in the Masters palette, or double click on the Master instance in the canvas. Remember that any changes you make to a master will be applied to all of its instances throughout the prototype. However, if you want to make an exception for a specific screen, right click on the Master instance in the canvas and select “Break the Master”. The master group will become a Dynamic Paneland you’ll be able to edit each standalone UI element as preferred. To change the name or description of a master, right-click on the master in the Masters palette and select “Edit”. To delete a master, select “Delete”. Note: if you delete a master, you delete all its instances from all screens. However, you can delete an instance from a screen or template without affecting the rest of the instances. 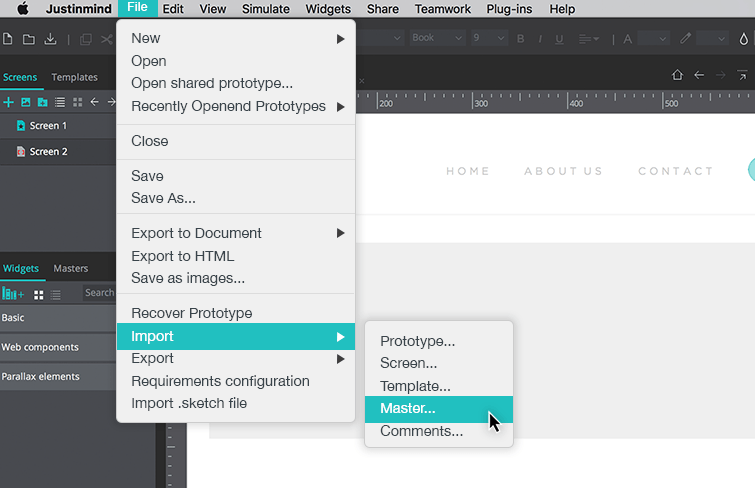 As with templates, you can export your masters to other prototypes and distribute them with other users. 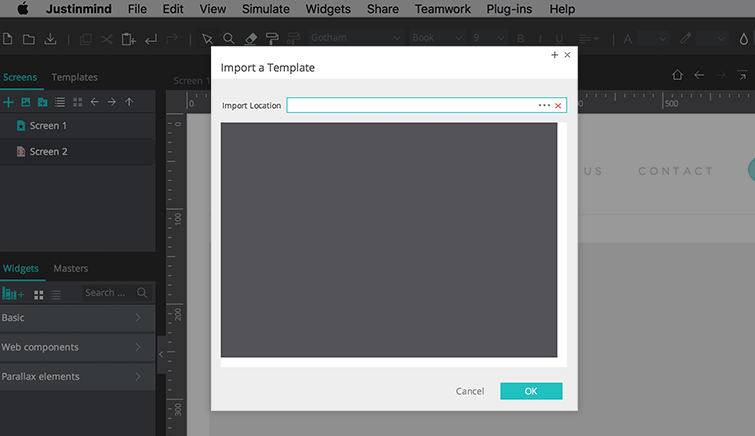 In the dialog that appears, select a template and export location. Click “OK” to export the master. To import a master, choose “Import” from the main menu. In the dialog that appears, browse your folders to find the master. Click “OK” to import it. 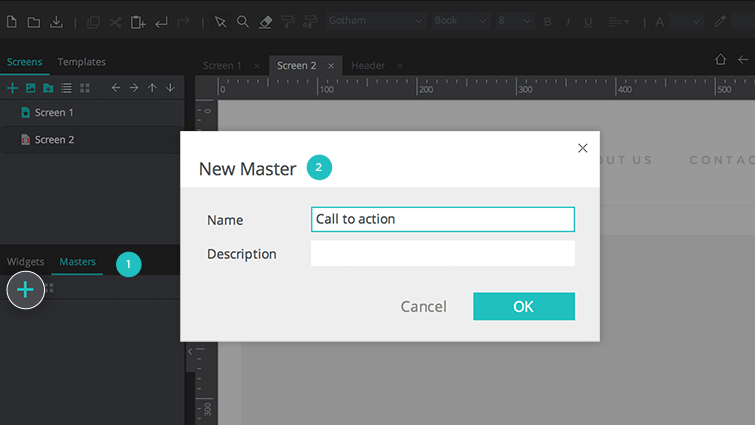 You can also import a master by drag and drop: just drag the file from your file system and drop it on the Masters palette, a screen or a template. Elements grouped within a master make it easy to apply global changes to more than one element at the same time. Just right click on an element and choose the “Group in master” option to do so. Give your new Master a name and click “OK.